The ancestors of modern Pomeranians have been bred for probably thousands of years in the Pomerania principality of what is now northern Germany. These dogs were typically working dogs of 20-30 lbs or more and of the ‘Spitz’ type with long, heavy bodies and longer, fox-like snouts than modern Pomeranians. The “Pommeranian” as it was then called was probably first introduced to England by Queen Charlotte, wife of King George III around the mid 17th century. Charlotte was originally from Mecklenburg, which neighboured Pomerania, and had been introduced to the breed at a young age. The couple had several breeds of dogs and many of the family’s Pomeranians were white in colour. White was the most common colour of these large Pomeranian ancestors at the time, where the dogs had much of a yellowish tint to the fur. Black, red or pale cream colours were more rarely seen. Pomeranians didn’t become popular in England until 100 years later when they were re-introduced by Queen Victoria. Victoria had at least 15 different breeds of dogs in her court and the Pomeranian was an important breed among them. Her first Pom was named Marco, a red sable she brought back with her from a visit to Italy, however her collection over the years included several white specimens. Notably, Victoria’s final wish before her death in 1901 was to have her white Pomeranian, Turi, brought to her bed to comfort her in her last moments. The trend very early after Queen Victoria’s reintroduction and exhibition of the Pomeranian was towards developing smaller companion animals. Quickly, breed standards were developed that specified smaller sizes, from the initial 10-12 lbs or more down to 8 and then 7 lbs as the maximum, with 4-5 lbs being most desirable. For the white dog, lemon colouring quickly became highly undesirable. The red or orange sable also became the most popular colour and whites fell out of fashion. The reasons for this were two-fold: 1) the “new” type of smaller companion, lap-sized Pomeranian was suddenly in vogue in the opulence of the Victorian era and it was more desirable to have a dramatically colourful sable than a boring old-style lemony white dog, and 2) more significantly, it quickly became apparent that unlike the relative ease of breeding down the sables and other colours to small lap dogs still possessing the dramatic, harsh standoffish coats cobby body and other characteristics of the desirable small pom, breeding the whites to the new size standard was problematic. It was difficult to produce small dogs of proper type and good quality coat in white colour with proper black noses and without lemony tinges to the fur, so breeders rarely concerned themselves with this challenge and rather focused on the chic new orange sable Pomeranian lap dog. 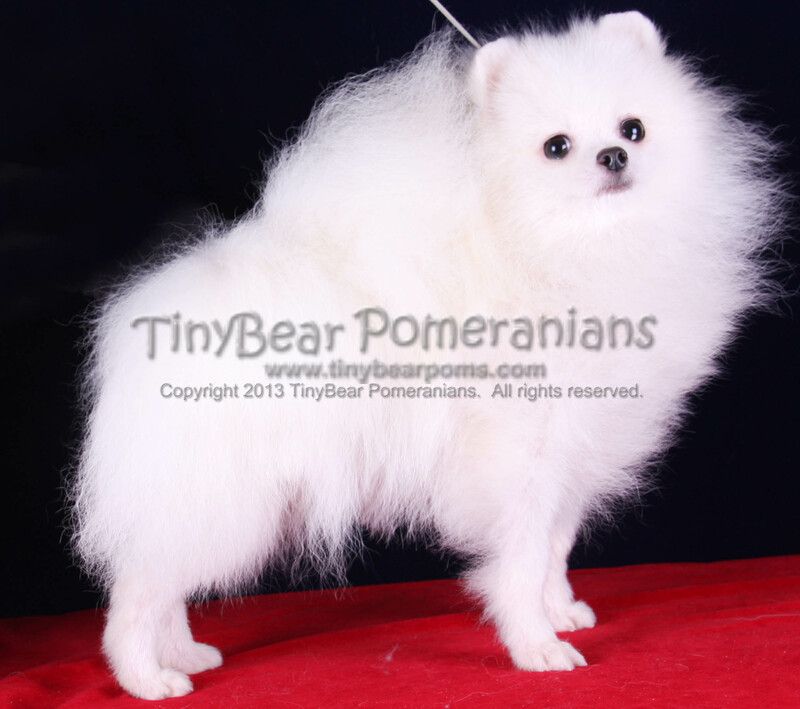 Today the White colour remains the most difficult to achieve in Pomeranians. True Ice Whites who maintain the standard for coats, size and black points are quite rare but beautiful, and are now therefore highly desirable. 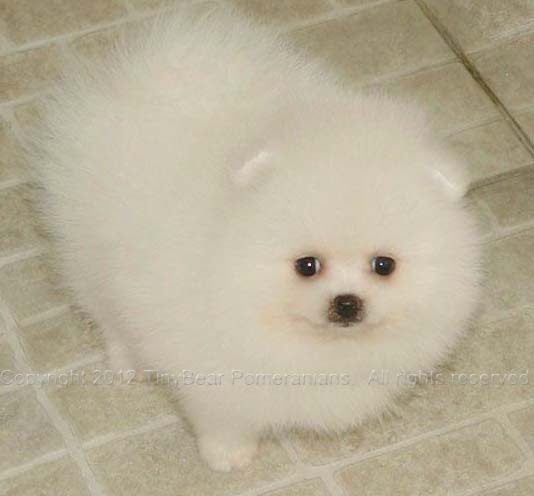 Ice white Pomeranians have now become the new fashion over the ubiquitous orange sable. Keep watching as we take on the challenge of developing our own quality white lines that meet the breed standard for size, type and coat quality. The whites are a very welcome addition to our breeding program.